One of my favorite aspects of team collaboration is creativity. Working together, a team can often generate much more innovative ideas than team members can come up with on their own. Doing this isn’t hard — but it does take a willingness to try some unexpected approaches. I began my career in a role where I had to be creative under deadlines every day. Starting out as a reporter/producer at NPR and then American Public Media’s Marketplace, I had a front-row seat to the extremely high-octane collaborative environment of daily breaking news. When my lifelong dream of running my own creative agency, Horse & Cart, became a reality in 2012, I brought everything I had learned about creativity from my work in radio, along with my experiences in PR agencies and in-house marketing departments. While there’s no perfect recipe for ensuring creative collaboration every day, I have seen three principles come into play in our creative agency in all of our best collaborations — no matter who’s involved. These three components are essential to ensuring that you’re giving your team the best possible opportunity to think and act creatively. The team that shares data, resources and information freely not only produces better decisions and outcomes, it also forms a stronger bond between all of its members. This sense of “abundance” gives teams a rich source of ideas and inspiration from which to draw. 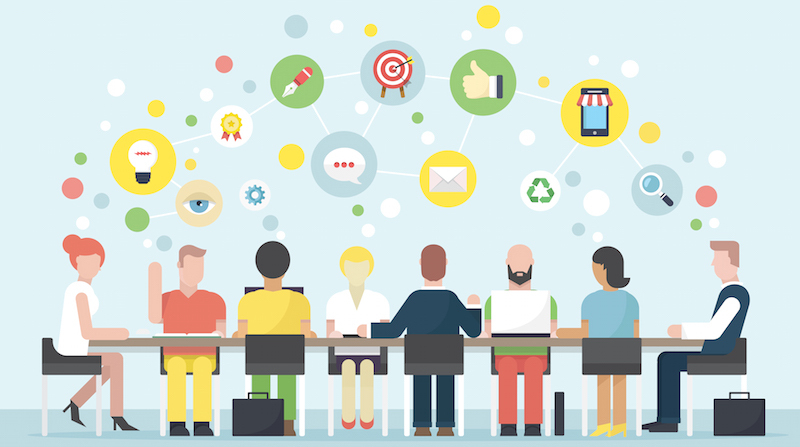 TRY THIS TIP: Ask each member of your team to come to the next meeting with 5 of their favorite work tips, tricks or resources to present and share with the group. Have a speed round where everyone gets to share all of their ideas. By the end, you’ll have an embarrassment of riches — abundance in action! Take a poll at the end of the meeting to see if this technique is one the group might like to try at a future meeting with another topic. The fact is that there is no more powerful fuel for the collaborative fire than the free flow of information. Those who see abundance realize that it’s sharing their ideas — not hoarding them — that can elevate the group’s thinking. Not only do their inspirations, tips and tricks help the team come up with the best ideas for a specific project, but their generosity inspires more of the same from their colleagues. Some of us have a tendency toward a scarcity mindset, perhaps from having encountered work settings in the past where there was a culture of silos. But even us “scarcity cats” (and yes, I was one once myself) can work to address this tendency and collaborate better. Starting with the abundance approach is not only essential to effective collaboration tactically — it’s also the linchpin for collaborative creativity cornerstones two and three. Just as it’s impossible to drive collaboration without a free exchange of ideas, a spirit of open, fearless sharing is essential to building the trust that’s essential for creativity. Try to imagine a productive collaboration that doesn’t bring these elements together and their importance comes clearly into focus. Aside from making for rather quiet meetings more akin to poker games, the very act of one person stonewalling inspires more stonewalling, and so on. As everyone in the group sits in fear that the others will seize on their weakness, or worse, claim their ideas as their own, the trust between group members begins to crumble. Soon there is no safe perch for engagement, no footholds from which to elevate or propel the project. TRY THIS TIP: Facing a creative block can be the very best time to test and build team trust. Try this out the next time your group is feeling uninspired: Announce that the regular meeting has just become a client pitch. Each member gets to take the stage and present a complete idea on the spot (like improv comedy). The rest of the team can contribute to the idea — positively, with ideas that move it forward. It’s a great way to shake things up, put people to the test and reinforce the team’s comfort with live brainstorming. Trust isn’t only driven by sharing, but it starts there. It’s also built on the idea that everyone’s contribution is valued even if some members share more and others less, or if someone shares an idea outside of their area of expertise. In our creative team collaborations at Horse & Cart, we don’t let titles get in our way. A developer may just as well pitch a creative concept as a bred-in-bone creative. In this regard, trust goes beyond openness and transparency to a collective realization: it’s only when we allow ourselves to go out on a limb among trusted colleagues that some of the best ideas materialize. Having fun is one of our company ideals at Horse & Cart — and it has has yet fail us as both a strategic and tactical tool for improving team cohesiveness. In the context of creative brainstorming meetings, it may be something as simple as sharing an ice-breaking anecdote or kicking things off with a funny cat video. TRY THIS TIP: In ongoing collaborative work, it’s important to find ways to bring fun into everyday processes. One way to do this is with a “special assignments” desk in your favorite collaborative communication platform (in our case, it’s Redbooth) or shared to-do list. On a regular basis, assign your team members a thoroughly ridiculous task. It doesn’t just produce laughs — you also get a good dose of team building. When we started our agency we took an afternoon to brainstorm a slogan for Horse & Cart. Someone suggested “Keep Marketing Fun,” and it was a hit! We even made our very own embossing stamp out of it. But you don’t need to be a creative agency to be creative — or to have fun at work, for that matter. The ability to inject the spirit of fun into team collaboration goes a long way toward keeping it fresh, collegial and even playfully competitive. The fact is that real fun rarely gets in the way of actual work, but it certainly helps to bring people together, increase camaraderie, and get those creative ideas flowing.